There are many unique ways to support Feed More, outside of the traditional donations of food, funds and time. When you shop at AmazonSmile, Amazon donates 0.5% of the purchase price to Feed More. Simply shop using the Feed More link and support us in the fight against hunger every time you shop! If you would like to donate your car, please complete the Car Donation Inquiry Form with details about your vehicle. Every November, we sell holiday cards and all proceeds help provide food to our neighbors in need. Personalized options are available and these cards are the perfect way to spread meaningful holiday cheer to friends, family and loved ones. 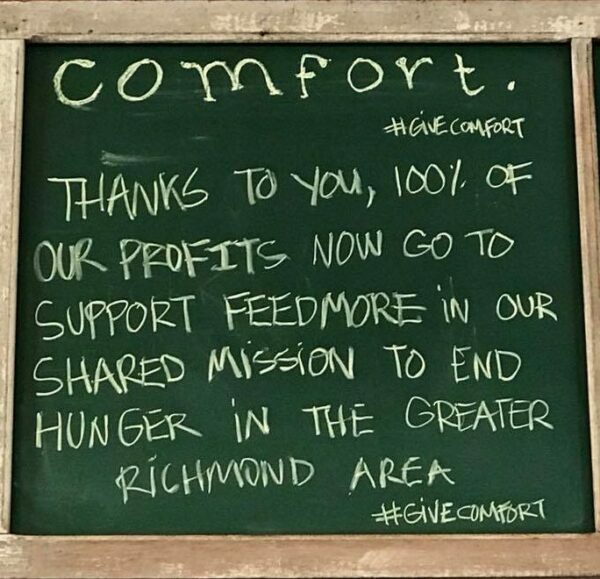 Focused on making a positive and real impact on the Richmond community, comfort. is donating 100 percent of their net profits to our hunger-fighting operations. Throughout the years, comfort. has supported our mission in a variety of ways and we are beyond proud to have them by our side as we help our neighbors in their times of need. Help us #GiveComfort to our neighbors in their times of need by enjoying a delicious meal at comfort. Looking for an easy way to join the fight against hunger? If so, sign up for the Kroger Community Rewards program and help our more than 200,000 neighbors who struggle with hunger. Simply sign up online at Kroger.com/CommunityRewards with your Kroger Plus Card and select the Feed More, code FK952, as your preferred charity. Once you’re enrolled, you’ll help our neighbors in their times of need every time you shop and use your Kroger Plus Card! For every tire sold at their Richmond locations, RNR Tire Express will donate $1 to our hunger-fighting operations! That means when you outfit your car with four new wheels, you can help us provide 16 meals to our neighbors in their times of need. Help us distribute food and smiles year round.